Garvin 5-pc. Dining Set With a straight-line contemporary design bathed in a warm brown finish, the Garvin 5-piece dining set features a unique stepped tabletop design and grid-style chair backs to create an exceptional contemporary look that is sure to enhance any dining room decor. With a straight-line contemporary design bathed in a warm brown finish, the Garvin 5-piece dining set features a unique stepped tabletop design and grid-style chair backs to create an exceptional contemporary look that is sure to enhance any dining room decor. 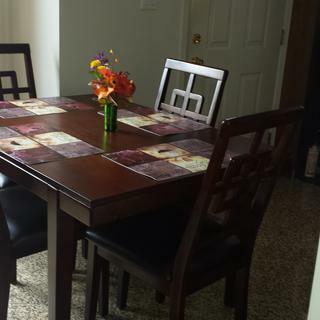 L: 48.5" x W: 36.5" x H: 30"
L: 23" x W: 18.5" x H: 39.5"
We love this dining set. the color goes well with our apartment and it looks like it costs a lot more than we paid for it. Good table. Has held up over a year of use. Shows light scratches (although you have to really be looking for them). Im very happy with the purchase. The dining set looks amazing in the space! So spacious and goes well with basically everything. The chairs are so comfortable as well! Had it for a few days, got it delivered to my home within 3 or 4 days of purchasing. They already assembled the chair prior, so they only had to put the table together. Overall they were in and out! We live in an apartment and it fits prefectly in our dining room. It’s like a medium sized table. We absolutely love our table. It appears to be strong and reliable! Very clean, sleek and modern finishes. It looks great in my kitchen I am so happy I bought it. I will recommend it to my friends. Our dining table is beautiful for us. We like Raymour & Flanigan furniture store. We definitely recommend y'all to go and visit them. Ask for Elvia she is bilingual very helpful. I love this set it looks perfect in our home. I would definitely recommend this dining set. Great table!! Well made and goes great in my home!! I love the table. It fits my home. The crew was nice. I love everything about the Garin 5-pc dining set. I would recomend the set to my family and friends. I posted the set on Facebook. How much weight can a chair hold? BEST ANSWER: The maximum weight capacity for the Garvin Dining Chair is 250 lbs. is this set strong or flimsy? BEST ANSWER: Strong. Family of four with two teenagers have used it for about a year. I haven't had to tighten the seats yet. I'm happy with it. Only complaint is the table scratches easily. Not deep scratches, you have to look for them to see them. It's quite strong. You'll be happy with it. It's a sturdy set. Can I purchase just the chairs? For how much? BEST ANSWER: The Garvin collection does not offer the chairs for individual purchase. This is an Outlet item, available as a set only.